You must sign into your myHangout account in order to contact mike_cabinet. I wanted to thank everybody who has purchased or inquired about my mute. So many of you have left me great reviews and many kind words that I am overwhelmed with gratitude. This whole venture started when I bought my first mute and it attached behind the bridge and had a steel roller that went up on over the bridge, it stored behind the bridge but because I have a Presto tailpiece and the third string came off the bridge at a different angle that the other strings the mute took my banjo slightly out of tune each time I used it. I also noticed that there were sustained overtones because the mute was always on the banjo. The task of taking it off each time was a real hassle. Then a friend loaned me a bar type mute but the bar was so big that it tended to buzz and had a very metallic sound that I didn't like. Then I made a mute out of wood that slipped over the bridge, similar to the metal ones I've seen on the market. It kept falling off. I then asked my banjo teacher about mutes and he showed me a bent bar type that silpped under the strings. I tried that one and found that it had to be bent tighter to mute the banjo and then it was so tight that it moved the bridge putting it on and off. Alas I went to work in my shop with what ever materials I could find. I had some steel but no effective way to work with it so I grabbed a piece of brass and some aluminum ell channel left over from other projects. The first one I made was just like the bar mute I had tried and just like the other one it buzzed and actually made the banjo too quiet so I slimmed down the brass til it stopped buzzing. Still something wrong, the steel screws going toward the banjo head worried me some and I didn't like the idea of steel threads resting against the Gary Sossabe bridge I had just put on so I got some nylon screws and tapped the aluminum ell to screw it from the bottom with brass nuts on top. I used this mute for some time at home and no one else knew of it. Then I started using it at the school where I took lessons so I could sit in the corridor and warm up without disturbing the other classes going on. Other students saw the mute and started asking about getting one. I started making a few here and there and giving them away. Then one day at a jam I was warming up and the owner of the music store where the jam was held asked me where I got it and how could he get one. Well I made him one and he started getting requests and asked me to make a production run for him to sell. I thought long and hard about what to call it and came up with The Banjo Mute-ation. Kinda cute I thought, and I put it out there for sale. Then you folks that bought it never once mentioned the name in your reviews, you just called it the Stidd mute or Mike's mute so I thought why fight it lets just call it Mike's Banjo Mute. My wife Sherry has been a great help with tracking the sales and expenses and she sews the little storage bags for each one. Although seldom mentioned in reviews or the many thank you e-mails I get I think everyone appreciates her effort in protecting the mutes. 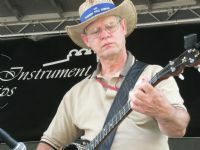 Again my thanks to everyone who has purchased Mike's Banjo Mute and to all the folks at the Hangout and the publishers and readers of The Banjo News Letter and Mitch Findley for the great review in the June issue. And a big thanks to Eric for letting me advertise here on the Hangout. mike_cabinet has 43 friends. View entire friends list. Earl, J.D. Tom Adams, Ron Block and all the usual suspects. And folks, ya gotta check out Cold Creek.